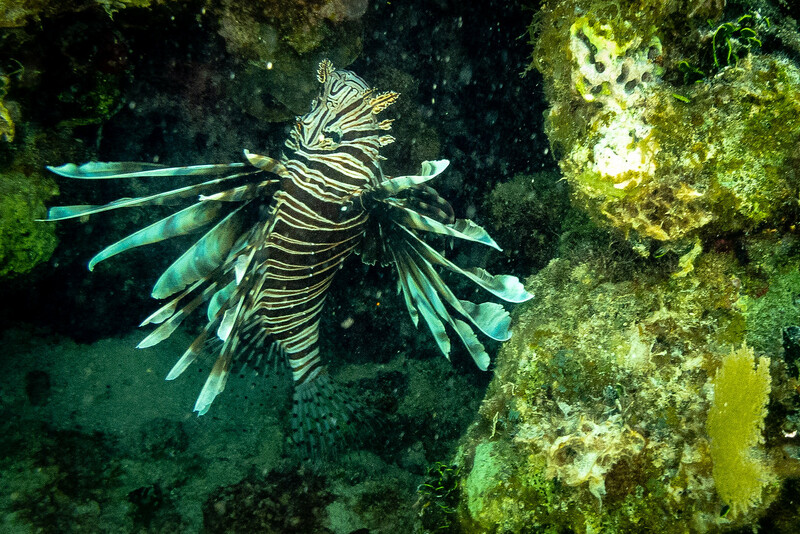 Just off the beach at our house in Xcalak, there lurks an unwanted predator: A reef invader the Lionfish. The Lionfish is known for their venomous spines making them a hazard to divers and fisherman. Of even more concern is that they are voracious consumers of native reef fish and have no known predators of their own. Because they breed year round and can lay thousands of eggs as often as once a month it is feared that the beautiful Lionfish can do serious damage to Caribbean reef ecosystems. Lionfish, prized as a $200 plus aquarium fish, were accidentally or carelessly introduced into waters near Florida in the early to mid-1990s and have since spread across the Caribbean. There is no way to completely control them, but efforts are being made to reduce their numbers. That is why I have been doing my small part by lionfish hunting. As of yesterday, I have five of these lionfish in my freezer. I expect, by Christmas, if I get five more of so, I may have enough for a small meal. After successfully hunting lionfish, you have to be careful when handling the catch because you want to make sure I don’t get stabbed by their venomous barbs when you clean them. I use gloves and pliers to hold them, and garden shears to remove the venomous spines. They are extremely boney, and there isn’t that much flesh on a lionfish either, but the meat is a firm white, buttery tasting flesh. Some people believe that eating lionfish because they are venomous, is dangerous, but once they are carefully cleaned, there is nothing to fear. They make a delicious ceviche, but I have seen them baked, fried and even put into soups. Some of the restaurants around Xcalak even offer lionfish on the menu when they can get them. Happy to be doing my part! I have to be honest; I don’t know. I know there are recipe contests and apparently there are a lot of happy eaters. The “Leaky Palapa” has Lion Fish nights on occasion the raise money for the reef. They are so small and bony it is going to take a bunch to make a meal. I will let you know, I am guessing at current catch rate, in November! Tell us more about the village you live in. Is it inexpensive to come there and stay? Do they have hotels there, and if so,what’s the average cost of a night? Also, I’d love to hear more about diving/snorkeling there. Do you have to SCUBA to see the reef or is snorkeling an option. Thanks…I’m enjoying following your travels.